matsuli music: "Retour en force des Amazones"
"Retour en force des Amazones"
The Amazones - back with a vengence! Thats the cry that from the opening track of the new recording by the all African, all-women, all-army band Les Amazones De Guinée. Its out already in digital format but set for 11 February CD issue in the UK. 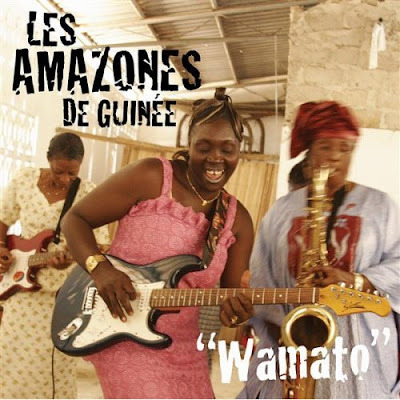 Les Amazones are best known for their 1982 LP "Au coeur de Paris" that starts with that wonderful introduction and the popular "Samba", played also by Moussa Doumbia and Bembeya Jazz National. My copy was on a C90 backed with Horizons Unlimited by the Lijadu Sisters and filled with Sam Mangwana's Canto Mozambique. It saw a lot of use and was eventually retired when I found the Au Coeur CD at Parade Music in Bondi a couple of year back. Anyway the new recording can be sampled below. Not sure of it will work if you don't have all the right plug-ins. This is good news. Now we need a reissue of "Au Couer de Paris" without all the dubbed-in crowd noises.